It wasn’t long ago that Eric ‘The Eagle’ Ochieng (16-4, 4KO) was being regularly showcased on Sky Sports whilst he bragged that he was ready to soar, a world champion in waiting. All of that was until Ochieng was beaten by Liverpool’s Liam Smith for the British light-middleweight title in the Autumn of 2013. In an effort to fix his problems and realize the unproven potential, Ochieng soon moved down to welterweight and he was matched against St Clears’ upsetter Dale ‘Big Boy’ Evans (9-1-2, 3KO) where his hopes would again be derailed. Originally, the pair had been set to meet at the end of 2013 in Ochieng’s home base of London. However, the running order for Matchroom Sport’s end of year show was packed and scheduling issues saw the fight scrapped after Evans’ fans had waited until the early hours of Sunday morning for it. Eddie Hearn, the promoter, addressed the issue by organising refunds and rapidly rescheduling the eight rounder for his first show in Wales at Cardiff’s Motorpoint Arena. It would be Evans who would enjoy home advantage and his 100 fans would only endure a 120 mile round trip, rather than their previously fruitless 430 mile trip. The re-arranged date in the following February forced Evans to train over Christmas, a testing time for any sportsman who has to meet a required weight, especially when they’re working over 50 hours a week in a factory. Despite the adversity and a hushed up niggling hand injury, Evans proceeded to the biggest fight of his career thus far, refusing to play the part of the underdog that he’d been painted as. From the first bell, Evans surprised the visitor by establishing a forceful jab. A natural brawler, Evans’ repertoire has always boasted dangerous left hooks and looping overhand rights but a fundamental jab had been a unfamiliar feature of the 23-year-old’s game for too long. 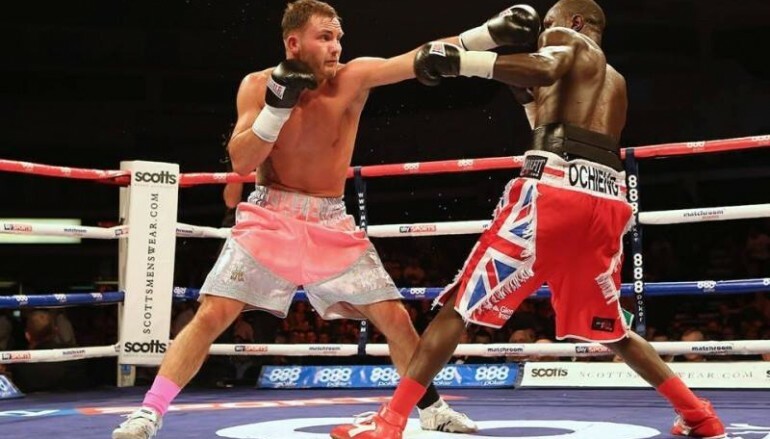 The jab neutralized Ochieng’s counters, retaining the range between the pair and ensuring that Evans didn’t fall in to uppercuts, short-straight rights and a sweeping left hook. Evans was dressed in a pale pink but there was nothing pale about his performance as he swept the first five rounds by keeping his opponent at arms length, leaving Ochieng to pose from the outside, unable to position himself to find gaps in Evans’ defence. Offensively, Evans was excellent, pouncing on Ochieng when the African born boxer walked himself to the ropes or corners. Right hooks up and downstairs made dents in Ochieng’s armor and on numerous occasions, he appeared to be sat on the bottom ropes in an attempt to escape exchanges, which by the letter of the laws of boxing, should’ve been ruled as knockdowns. 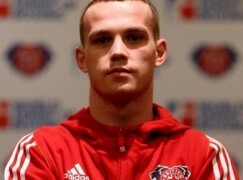 All of Evans’ hard work almost unraveled in the seventh round, as he appeared to be heavily hurt with flush right crosses. Evans gradually backed off and it seemed he was wary of conceding too much ground, such a move would’ve given Ochieng more momentum but it also left Evans remaining in range. For a full two minutes, Ochieng barely missed with his backhand but, still feeling the effects of being on the wrong end of the previous six rounds, he turned the screw too slowly. Not only did Evans bravely see out a torrid stanza, he came back to win the last round, too. At times in Evans’ three year career, he has shown flashes of real class, while he’s come close to blowing it at other times but it all came together for him in February, under the guidance of Gary Lockett and Graham Brockway. Officially, Evans only won by a single point on the questionable scorecard of referee Clarke Josyln, which was generous to Ochieng, but there was next to no doubt who the winner was, evident in both boxer’s body language at the final bell. Notable mentions: Frankie Borg v Kerry Hope, Chris Ware v Frankie Borg. Previous winners: 2013, Enzo Maccarinelli v Ovill McKenzie. 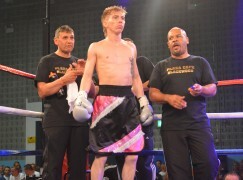 2012, Kerry Hope v Gregorz Proska. MAIN IMAGE BY HUW FAIRCLOUGH. Visit www.HuwFairCloughPhotography.co.uk for more sports images.